Making your own cheese always seems to be an extremely daunting undertaking and it can be, especially if you are trying to make hard cheeses. But there are a number of soft cheeses that are quite easy to make at home. The issue with most cheese making recipes is that they require a bunch of difficult to find ingredients. And, if you are lazy or last minute like I am, tracking down cheese salt, cultures and rennets and whatnot just isn't going to happen. 1. Mascarpone: This Italian cheese (shown at right) is very expensive to buy in the store (if you can find it) but very easy to make yourself. All you need is heavy whipping cream and lemon juice. 2. Ricotta: This one is, hands-down, substantially better homemade than anything you will find in the store. Especially if you go for whole milk (which I recommend). Just add a little heavy cream and lemon juice (or white vinegar) and you're good to go! 3. Cream Cheese: This one is idiot proof. 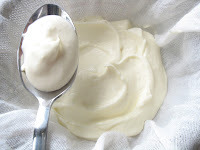 All you need to make your own cream cheese is yogurt! 4. Sour Cream: Okay, this one isn't exactly a cheese, but I couldn't not include it because it's so bloody easy to make. All you need is heavy cream and sour cream or buttermilk. 5. Paneer: This Indian cheese is fantastic even if you don't use it in a traditional Indian dish. Unlike some Indian recipes this one only requires foods you already have in your kitchen: milk and lemon juice. Wow, these are great, thank you! I've made ricotta but that's it. Very excited about the mascarpone. So, do I even have a kitchen if none of the rooms in my house have lemon juice? Or is my kitchen just bereft of the necessities? I do have evaporated milk. .
Brad - If you don't have lemon, you can use vinegar instead. Thank you for this post! I think I will try to make some cheese myself soon. Thank's for sharing! Can you gave us the proportion of milk and vinegar or lemon please? I would like to try some of your recipe :o) Thank's again! I have been wanting to make cream cheese. I am making cheddar cheese for Christmas this year, never done it before, and not sure if it will have aged enough, but I am giving it a go! A very timely post! We have grand plans to make our first batch of mozzarella this weekend. We've made ricotta before, and I ordered my first batch of rennet. Obviously the jury is still out, but if its a success, then I will be smoking said mozzarella (that sounds funny) and giving it to everyone I know for Christmas. Thanks for the great recipes. I have made your ricotta in the past...but haven't for a while. Maybe now is the time to make some! Caroline - If you click on the name of the cheese, it links to the recipe. Good luck! You can also use buttermilk as culture. But if you keep some flora danica in your freezer, chevre, fromage blanc and feta are super easy and don't require you to stand there getting things to a hot temp. I cannot wait to try making the Paneer, I have tried the Cream cheese and must admit I love it! Very neat, thanks. I foresee some homemade cream cheese in our future. Hi Deanna, great round up of soft cheeses. I have made them all over the last few years, and also make hard cheeses at home. I document all my cheesemaking adventures at my cheese blog called Little Green Cheese. It is a great hobby. Thanks for linking this to Simple Lives Thursday! If you save the whey from making your own cheese you can make soda bread with it. It tastes so much better! Thank you for sharing this! I think I will try to make some cheese myself soon.